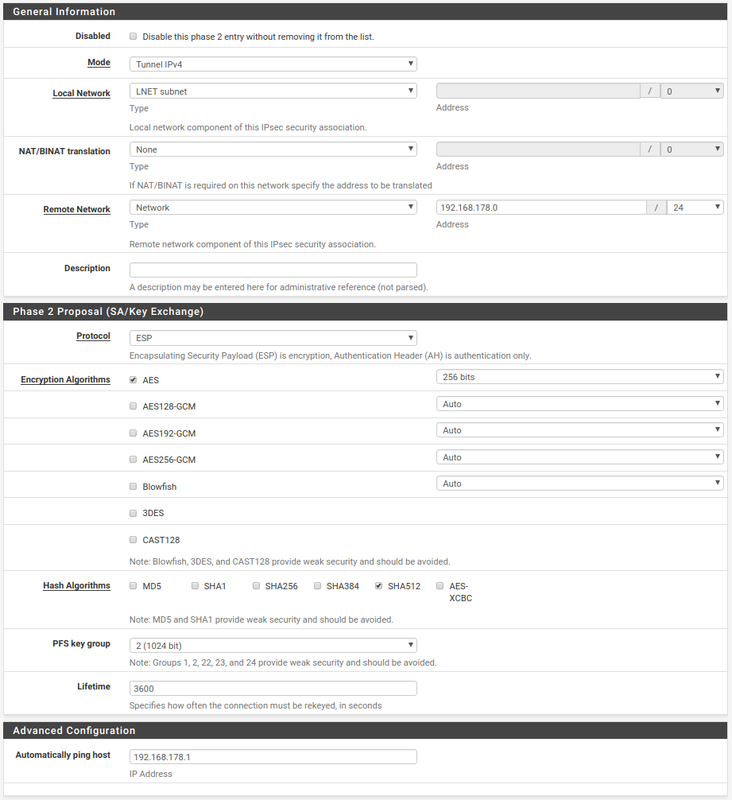 In my opinion, it’s pretty easy to set up a FritzBox LAN 2 LAN VPN with pfSense. The only hard thing is to figure out the preferred encryption and hashing algorithms supported by the FritzBox. I have this running now with pfSense 2.4.4 with both a FritzBox 7490 and a FritzBox 7590. An additional note: Sometimes does a Dual Stack connection not seem to be completely stable. In this case it helps to set Internet Protocol to IPv4 in phase 1. 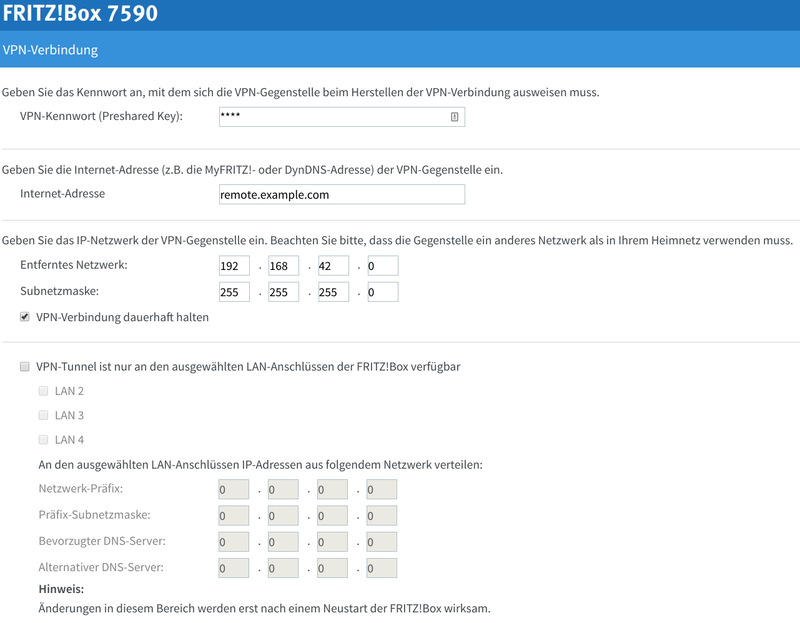 How did you configure FritzBox 7490? I cannot figure out the basic setup; which Key-ID to use? Actually, it’s quite easy: pfSense’s “My Identifier”/”Distinguished Name” should be the same (host)name you enter in the FritzBox’ “Internet-Adresse”. It’s basically the hostname of your pfSense gateway. I guess entering an IP address should also be possible, but as far as I know it has to be the same value on both sides, so if you use an IP address for “Internet-Adresse”, you should enter this IP address also as “My Identifier”/”Distinguished Name”. 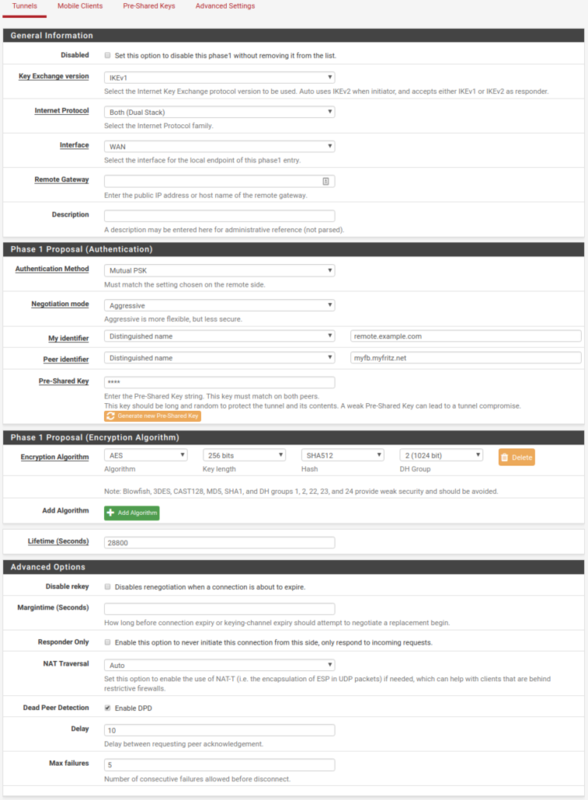 pfSense’s “Peer Identifier”/”Distinguished Name” has to be the (primary) external hostname of your FritzBox. I’ve only tried it with MyFritz DynDNS service, so the MyFritz name (123randomlettersxyz.myfritz.net) is the right one here. With other DynDNS services try its respective hostname.